Thong, CPA » Roger Perron Inc. When we purchased our home in San Marino we realized our standards would not be met by just a good location, so we retained your firm to design and build our dream home consisting of two stories, including guest house, garage, pool and landscaping as an entire package — and you definitely delivered that! Your designs and direction through the first phase, the design phase, proved to be a magnificent rendition based on our communication — it turned out exactly the way we wanted it. 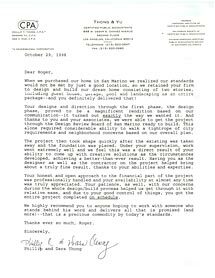 And thanks to you and your associates, we were able to get the project through the Design Review Board of San Marino ready to build. This alone required considerable ability to walk a tightrope of city requirements and neighborhood concerns based on our overall plan. The project then took shape quickly after the existing house was taken away and the foundation was placed. Under your supervision, work went extremely well and we feel this was a direct result of your ability to come up with creative solutions as the circumstances developed, achieving a better-than-ever result. Having you as the designer as well as the contractor on the project helped bring about a truly fine result, thanks to your abilities and expertise. Your honest and open approach to the financial part of the project was professionally handled and your availability at almost any time was truly appreciated. Your patience, as well, with our concerns during the whole design/build process helped us get through it with relative ease, and due to your good control of things, you got the entire project completed on schedule. We highly recommend you to anyone hoping to work with someone who stands behind his word and delivers all that is promised (and more) — that is a precious commodity by today’s standards. Thanks ever so much, Roger.